Effective from January 1st, 2017, it is compulsory for manufacturers, importers and suppliers of hazardous chemicals sold throughout Australia to classify them according to the Globally Harmonised System (GHS) Criteria for Classification and Labelling of Chemicals. The system was developed by the United Nations with the intention of harmonising the many different chemical classification systems in use around the world. GHS replaces the current NOHSC Approved Criteria for Classifying Hazardous Substances [NOHSC:1008(2004)] and the National Code of Practice for the Preparation of MSDS [NOHSC:2011(2003)] and the Labelling of Workplace Substances [(NOHSC:2012(1994)]. The implementation of GHS in Australia is mandated by the Work Health & Safety laws (WHS) which have been implemented by all state governments within Australia except WA, Victoria and the ACT. However as Chemform supplies chemicals throughout Australia, GHS classification of most of Chemform products is compulsory. GHS specifically relates to classification of hazardous chemicals used in the workplace environment and does not apply to the labelling of cosmetic and household consumer products in Australia. These retail domestic products are subject to the risk-based labelling requirements of the SUSMP. Consumer products and therapeutic goods used in workplaces in quantities and ways that are consistent with household use, and are used in a way that is incidental to the work that is being carried out, do not need to be labelled in accordance with GHS. 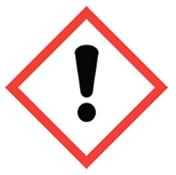 GHS does not replace or change the labelling requirements of Dangerous Goods, which must comply with the ADG code. It is also important to note that GHS includes a toiletries exemption. Toiletry products must clearly state hazardous information on the Safety Data Sheet but there is no requirement to demonstrate this on the label. GHS becomes mandatory on 1 January 2017, under the model Work Health and Safety Regulations (WHS) in South Australia, Northern Territory, New South Wales & Queensland. Victoria, Western Australia and the Australian Capital Territory have not yet mandated use of the GHS classification system and there is no confirmation as to when they will adopt the new system. Businesses are permitted to sell and use products classified under the current NOHSC system in these states. 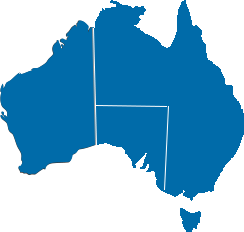 Refer to the jurisdictional progress page on the Safe Work Australia website for more information: http://www.safeworkaustralia.gov.au/sites/swa/model-whs-laws/pages/jurisdictional-progress-whs-laws. 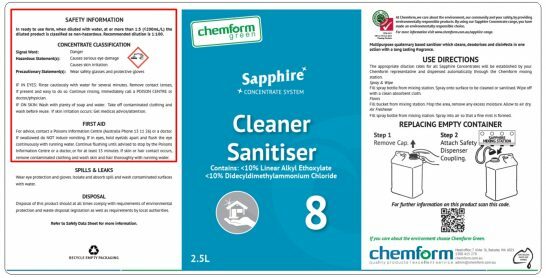 Chemform distribution partners selling cleaning chemicals in SA, NT, NSW and QLD are only permitted to distribute GHS classified chemicals (with correct labels) from January 1st 2017 onwards. End users of chemicals are still able to use, handle and store hazardous chemicals labelled in accordance with previous labelling code (for example, the NOHSC code) if the chemical was sold to them before 1 January 2017. Between now and January 1st 2017, we encourage our distribution partners selling products in the compulsory states to diligently manage their stock rotation. It is important to ensure that you only distribute GHS compliant products (with correct labels) post January 1st 2017. GHS is not compulsory in WA, VIC & ACT and the state governments are yet to confirm when they will adopt the new classification. Therefore, it is business as usual in these states. However, you will begin to notice Chemform chemicals that will be classified under GHS. 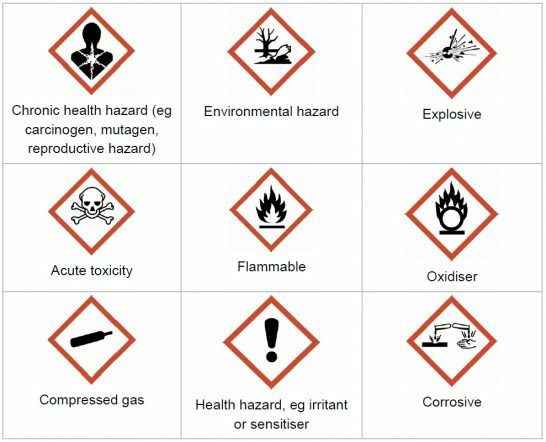 We suggest you familiarise yourself with the new classification system and encourage your customers to complete our online Basic Chemical Awareness Training: www.chemform.com.au/training. Our hands-free dispensing equipment ensures the dilution of hazardous chemicals is safe, accurate and cost effective. In most cases, no changes have been made to the ingredients and formulations of our products. They will be the same chemicals you have always used. Product performance will remain unchanged and we will continue to review our range of products to ensure we continue to offer safer and environmentally preferable alternatives. What are the specific GHS changes? There are now nine diamonds surrounded by a red or black border, with two new symbols for those that affect human health and one for environmental hazards (not compulsory in Australia). States the hazard and the precautionary measures that should be taken. Where can I find information about a product’s GHS classification? Chemform will continue to release a 16 header Safety Data Sheet (SDS – replaces the MSDS) and GHS classification information can be found within the SDS or on the label. SDS’s can be downloaded from the Chemform website – www.chemform.com.au/smart-search. Section 2 of the SDS and the label feature specific hazard information. Below is an example of both. Safety Wall Charts are not mandatory by law and are provided by Chemform as an additional product information reference for our customers. Our Safety Wall Charts will be updated to reflect GHS information. Products classified as hazardous under GHS will now include: Concentrate form hazardous statement/s & diluted form classification statement. In the Sapphire 2 example below, the product causes serious eye irritation in concentrate form, however it is non-hazardous when diluted with water at or more than 1:1 (≤1000mL/L). Products classified as non-hazardous under GHS will simply state ‘Non Hazardous’ on the Safety Wall Chart. The responsibilities on business owners and managers related to storage and handling of hazardous chemicals including identifying hazards will remain unchanged. Chemform can provide information regarding GHS, but the WHS act and regulations places the onus on individual businesses that store, use and handle hazardous chemicals to train their own staff. Chemform’s Basic Chemical Awareness Training, Chemform eLearning, has also been updated to feature new modules and questions about GHS. 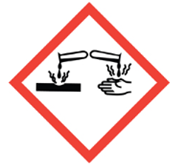 We recommend that all employees complete the training to familiarise themselves with GHS: www.chemform.com.au/training. The video below released by Safe Work Australia describes what the new system means for manufacturers, suppliers and users of hazardous chemicals. Visit www.safeworkaustralia.gov.au for more information.